Things have been super strange over in Etsy-land lately, with sellers talking about moving over to Amazon Handmade and buyers seemingly absent. My mala shop has been hard hit after years of its being a reliable part-time, serious job for me, one that I've loved for almost 8 circles of the earth around the sun. So I've been a little bit concerned. But I think concern does absolutely no good unless you do something about a situation or at least reconcile yourself to whatever's concerning you. So, after a day of reading and study, I've come to a conclusion. Things change! Ah hah! Changes in an online venue perfectly underscore the truth of impermanence. We can try to cling to things, people, cozy situations, but look around...the world is changing. The world is on fire. Everybody needs to step up and pull their heads out of the sand. Me too, of course. Wherever you're stuck, whatever you think is absolutely necessary for your comfort and survival, take a good hard look at it. That's what's keeping you from growing. The hardest thing to give up is sameness and comfort. This post was going to be called Ch Ch Ch Ch Ch Ch Ch Ch Changes, but that seemed a little bit far out for a mala-maker's blog. Still, it is my theme song today. What will I do? Will I migrate to Handmade at Amazon and brave the Bezos world? Send my malas out immediately via drone? Hmmm...no. Not even if I could. 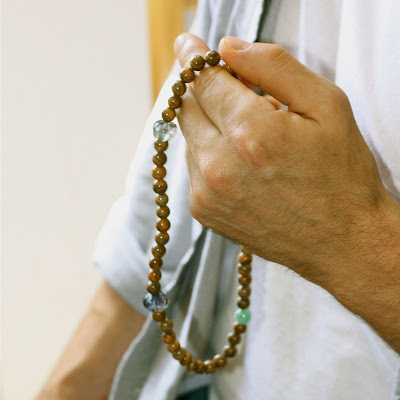 I will continue to make the most beautiful, luxurious-looking malas I can for the sweet, smart customers who can find me, buried on page 4 of Google search. But I will ALSO be painting! And maybe there's time (yes, there is) to go back to yoga a bit. Life changes, families change, the world changes --- nothing is as it seems, nothing is permanent, life is not safe or reliable. The Buddha was absolutely clear on this, so were most sages and prophets. So, I'll roll with the changes, keep my heart and soul in everything I do and make. And try to remain chill about it. Things will work out. And in the meantime, while it's working out, I want to thank anyone who's read this far, who's ever read this sorry little speck of a blog in the past, and everyone who's ever purchased a Heart of Compassion Malas mala. You've made so many things possible, I'm truly enlarged by the experience of meeting you. Carry on. And be well! Thanks for this post. I hope things work out with the mala business.. You make beautiful malas. I still use the one you made me years ago. I'm glad you're gonna keep on keepin' on..
a good read - well said! i also am cued into the uncertainty, change, impermanence these days - but also much joy. may your malas find the best home..! Heart of Compassion Malas. Ethereal theme. Powered by Blogger.